There is a prevailing phrase known among DC Comics fans for what seems like decades now: “You can’t have a Crisis without a Flash.” Since the series’ first season on the CW network, The Flash has been hinting towards a truly apocalyptic event dwarfing anything that has preceded it. This event portends a disaster of hitherto unseen magnitude, with crimson skies blanketing not only Central City, but the entire world. In the aftermath of this “Crisis,” Barry Allen, Central City’s resident speedster and protector – better known by all as “the Flash” – goes missing. The headline in Eobard Thawne’s hidden room at S.T.A.R. Labs has ominously displayed the words, “FLASH MISSING – VANISHES IN CRISIS,” telling of Barry Allen’s mysterious disappearance following this as-yet-unexplained event. Season 5 revisited this topic early on and explained that Nora, Barry and Iris’ impulsive speedster daughter from the future, grew up her entire life without knowing her father because of this very event, and we were given an additional headline from the year 2049 that states, “25 YEARS LATER – FLASH STILL MISSING.” What does this all mean for the future of our Scarlet Speedster? Savy, well-educated in comic lore Flash Fanatics likely picked up on what the series writers were laying down from the get-go with this headline, but a hint for those whose Flash knowledge comes largely or strictly from the CW show, or who have had the foresight to tune in to this very segment – it all comes down to this: Crisis on Infinite Earths. Created by the superstar team of Marv Wolfman and George Perez, Crisis on Infinite Earths was a twelve-issue crossover event from April of 1985 through March of 1986, and involved the entirety of the DC Multiverse. The purpose of this series was an attempt to streamline the DC comics universe and compress it down to a single universe – no more multiverse – and thereby repair 50 years of confusing character origins, among other continuity problems that had made the universe incredibly non-user-friendly. The scope and scale of the story were massive, and to that date, it was the largest event seen in comic books. I’m not going to get into the weeds of this continuity-resetting event, but the long and short of it was that a being known as the Antimonitor had begun to destroy the Earths of the multiverse one by one, eradicating them and all life inhabiting them from existence; this is represented by an infinitely expanding crimson energy engulfing and erasing everything that it touches. To combat this growing crisis, the Monitor began to recruit heroes and villains from across the multiverse in an effort to defeat the Antimonitor; however, the Monitor was murdered when the Antimonitor took control of Lyla “Harbinger.” Eventually, and nearly too late, the cosmic being known as the Spectre was able to unite the factions of good and evil long enough to prevent all of existence from total annihilation, but the result was only one universe, one Earth, remaining when the red skies cleared. Crisis on Infinite Earths was known not only for its scale and continuity-rebooting results but also for its immense death count. Hundreds of DC heroes and villains from across the current multiverse lost their lives in the battle to stave off the end of all things, and not just D-class, 4th-tier characters either; well-loved characters such as the current Supergirl and Barry Allen gave their lives in the fight as well. Barry Allen’s death, specifically, was a real turning point for DC Comics moving forward. He had only just returned from the future, where he and his wife Iris had been in hiding, and he had all but hung up his boots as the Flash. But, as true a hero as they come, Barry not only came out of retirement to help but made the ultimate sacrifice in what was one of the most devastating deaths in all of comic books (certainly in DC). Running faster than he ever had before, Barry Allen ran counter rotation to the energies being emitted by the Antimonitor’s weapon of Armageddon, the Antimatter Canon. In doing so, the Silver Age Flash ran himself to oblivion and readers bore witness to a disintegrating Barry crying out for help and that there is always hope. That was intended to be the end of Barry Allen’s story in DC comics, but we’ll come back to that shortly. Flash-forward twenty years to 2005 and Geoff Johns’ Infinite Crisis. The seven-issue event involved Alexander Luthor, desiring to create a “perfect world” by restoring multiple alternate Earths from the former multiverse. Naturally, this results in more problems, as the Superboy from Earth-Prime goes mad with power and begins murdering numerous heroes and villains. The mad super proves to be immensely powerful, too much so for the likes of the JLA, the Teen Titans, and even both the present Superman and the Superman from Earth-2 (the Golden Age Superman). How does this harken back to my earlier statement that “there’s no Crisis without a Flash,” you might ask? The primary Flash of this era was Wally West, formerly the first Kid Flash under Barry Allen, and he was pulling double duty with the Titans (the grown-up collective of his former Teen Titans teammates) and the Justice League of America. 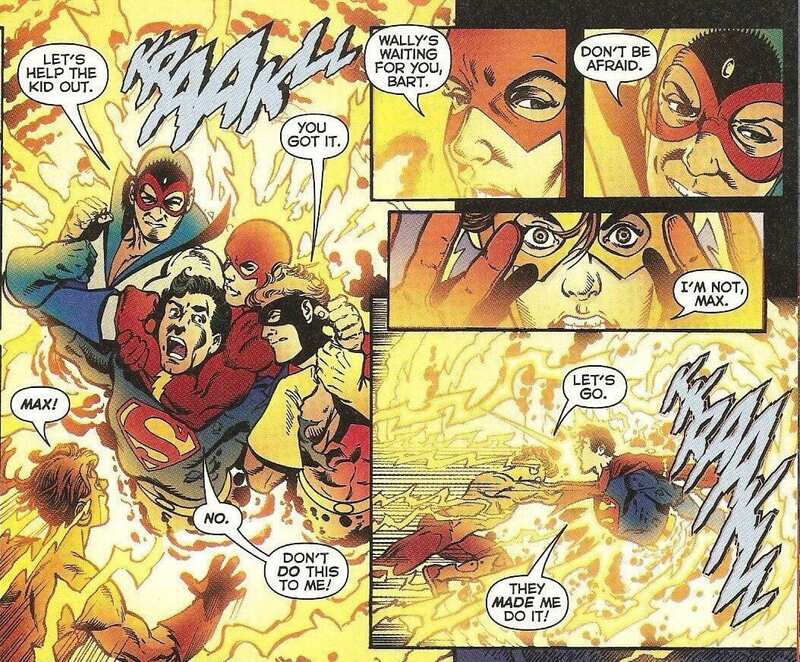 During the battle against Superboy-Prime, Wally, Jay Garrick (the original Flash of Earth-2 and the Golden Age), and Bart Allen (Barry Allen’s grandson from the future), the current Kid Flash, speed into the fray and grab hold of the psycho super in an effort to trap him within the Speed Force. Jay Garrick, being well-past his prime at this point, tells his two younger relay partners that his tendons are beginning to tear from the strain of their current velocity and that he can’t go any farther. Wally thanks him for helping them with the head start, and he and Bart push forward, all the while trying to avoid Superboy-Prime’s raging heat vision blasts. Breaking open the barrier to the Speed Force, Wally West tells the young Allen to keep going as he starts to fade away – himself becoming absorbed in the Speed Force and flung into another time. Wally appears before his wife, Linda, and their twin infants, Jai, and Iris (II) and tells them that he loves them more than anything but has to go now. Linda, unwilling to let go of her husband, grabs hold of him, and their entire family vanishes into another time. This was meant to be the end of Wally West’s story, as Senior Vice President and Executive Director Dan DiDio held a strong dislike for the third man to bear the mantle of the Flash. With the fastest man alive gone, Bart is unsure if he can keep going and do this alone, but we would then learn that his grandfather, Barry, was not dead but instead trapped outside of our dimension within the Speed Force all these years, along with fellow speedsters Johnny Quick and Bart’s former mentor Max Mercury, when they emerged to aid the Kid Flash and pull Superboy-Prime into the other dimension. Bart, too, had then vanished within the Speed Force, and Jay said that he was no longer able to feel it anywhere, until the aftermath of Infinite Crisis when Bart was revealed to have returned, but had absorbed too much of the Speed Force and had quickly aged from a teen to a young man. Handing his grandfather’s uniform to Jay, he told the first Flash that he was once again the fastest man alive. Flash-forward once again to 2008 for the great Grant Morrison’s Final Crisis. Following the fifty-one-issue Countdown to Final Crisis, the plot revolved around the infamous New God villain Darkseid attempting to overthrow all of reality after the War of the New Gods. Final Crisis was an apocalyptic event, a singularity at the heart of creation that is rapidly bringing the entirety of creation into it, which would denote Darkseid’s ultimate, final victory at the moment of his impending death. The event was devastating, resulting in the death (albeit a temporary one) of Bruce Wayne (though it was revealed that he was sent far into the past, near the very dawn of man – and more was later revealed in the 2017 event Metal). The Flash’s involvement? It was a big one. Wally West and his family had returned from the future (see the above segment as to why he went there in the first place) and was once again pulling double duty on super teams. Barry Allen is brought back from the Speed Force, having been running for his very existence from the Black Racer (essentially Death), and together, the former mentor and protégé lead the Black Racer across reality, and Darkseid’s own Omega Beams in a brilliant return-to-sender moment, to ultimately take Darkseid out at last. Final Crisis, nearly twenty-five years after his heroic sacrifice during Crisis on Infinite Earths, brought back Barry Allen to the DC universe landscape and almost immediately resulted in one of, if not the, greatest Flash stories ever told, Flash: Rebirth, which reunited the Flash Family that had, event after event, been lost and found in Crisis. So, there you have it; the recap of the involvement of the various Flash members throughout the Crisis Event Trilogy. Hopefully, this little tidbit was helpful and thought-provoking with regards to the CW show’s hinting at a Crisis-level event!